CARLETON MEMORIAL – More than just a satisfactory user experience. Recently I published a blog titled “Before You Tar Us With the Same Brush”. So this is chapter two and I have two questions. Are you among the legions of people who believe that there is something “off” with life in general – “off” because people don’t know their neighbours, that they are lonely, that they crave community in a meaningful way? Are you someone who feels that most of your efforts go towards coping rather than building something more psychologically sane and emotionally healthy? I am sure that if you are still reading this blog you are – to some degree at least. “What difference will it make – I mean really make in a meaningful way – if I pray to an invisible, esoteric God?” is the way you might pose the question in a respectful yet challenging way. Some would use much stronger language. And I am going to push it a little further: Even to a believer, the Sunday experience, regardless of how inspiring it may be, will not make much of a difference if it is not rooted in family, friendship and community. As a pastor I am more interested in “how” somebody believes than “what” somebody believes. SO… when you allow your faith to lead you into a place of human peace, courage and confidence, it’s amazing to see the psychologically sane and emotionally healthy things you choose to devote your time to – to be community for community “just because”. Faith in God – remove the “superstitious rabbit’s foot” approach and what do you have left? The good stuff. A clearer perspective on your ability to effect positive change and a deep seated appreciation of what it means to experience grace in your life. 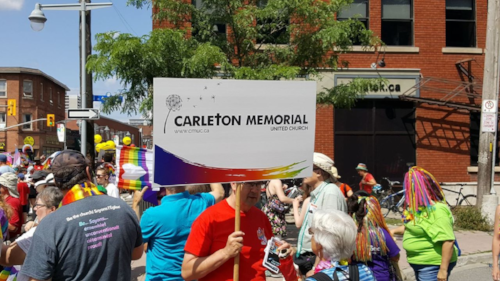 Who is Carleton Memorial United Church? Has three support groups for adults of all generations. Has a children’s program that fosters self-expression, self-understanding and self-confidence through real-to-life lessons and meaningful interaction with adult members. Has a clothing depot that fosters dignity in those needing some help. Has a choir because we understand how good it is for us to sing. Is active in supporting overall wellness of students at Algonquin College and Carleton University. Has a group of volunteers who look in on people who are home-bound. Has a hospitality crew that makes every dinner, reception, or funeral feel like it has a personal touch – because it does. Ethically sponsors refugees and maintains a link with these families to help them integrate into Canadian society. Christian interpersonal values. We are about transformation through community, not community through indoctrination. And …. then there are all the friendships and trustworthy relationships the grow out of this, cemented in a faith the makes a real difference right outside your doorstep. CMUC – There are only so many words to describe it. Come and walk the talk. It’s a wonderful journey. One of our mottos is – We care less about where you have come from. We care more about where you are headed.